Web Apps that tell you your IP are a dime a dozen. The problem is that most of them go overboard in trying to flashy, fill their pages with ads and most often than not don`t tell you what you need to now in a direct and clear way. 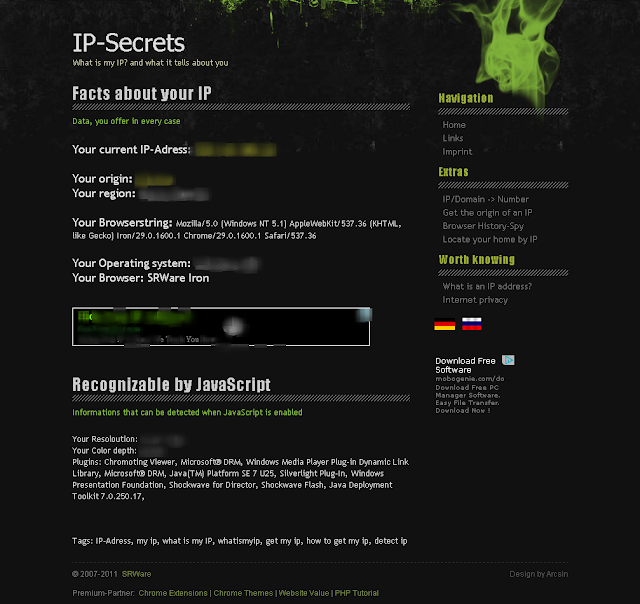 IP-Secrets is a simple web app service that tells you your IP and the information about it relevant to it plus what your browser told the site and what it tells every site you visit. This done in a clear and simple way. All relevant info exposed in one page with few ads and telling you where does the info came from and how. Apart from this, IP-Secrets also offers a Domain to IP number converter, an IP to country code resolver, an IP to geolocation tester and a browser history spy tester. All offered in a honest manner for free. IP-Secrets is then an IP finder and info guide web app i wholeheartedly recommend you to keep in your bookmarks. In the post where I detail My Stance On Bitcoin. I said I had a problem with the overly simplistic or overly complicated and now canned ways the question to What is Bitcoin gets answered. Here I will detail why and my own way to answering that. 1.- Because many answer that question only focusing in it being a digital currency. 2.- Because many answer that question focused in highlighting the peer to peer nature and base of it obviating the reiteration on it being a digital currency. 3.-Because many answer that question with a personal politics agenda tint that dilutes what is being answered. 4.-Because many answer that question diving into metal making the answer hard to understand clearly for as much people as possible. For anyone that has been following Bitcoin the past few months since it reached a mainstream buzz or longer. These descriptions should hit the mark. 1.-It is a Digital Currency. Bitcoin is a digital currency because it can be used as an unit of account in reflection to traditional ones and exchanged in for value in the same way you would use cash money in real life. Just with electronically enabled conventions of use. 2.- It is a Digital Commodity. Bitcoin is a digital commodity because its units of account where value gets stored are scarce in a deflationary manner because of the way new bitcoins get into circulation. That involves mining-alike work and investment and because there is an exact predefined and finite number of them known in advance to the point where its discovery follows a predictable timeline. 3.-It is an innovative Info Network Design Architecture. Bitcoin can exist and it is exciting thanks to the way its network works. Its Protocol. That is in a decentralized peer-to-peer computing cloud nature. Based on the balancing of the inherent and inhuman distrust managed by the cryptography flowing through it and the inferred human trust needed that evocates and powers its economic perceived value. Bitcoin is a platform because things can be build from it, for it, with it that in turn get to be connected to it. Any platform main principle is to be utilitarian in order to facilitate goals, projects and innovation. Bitcoin is then and can correctly be seen as a platform. Because it is. 5.-It is a Payment System. Bitcoin is a Payment System thanks to the 4 previous things it also is and got going for it. And because it can be exchanged to any FIAT currency. Wait, But how you are going to articulate all of that in a simple phrase? Bitcoin is an Economic System and Monetary Technology and Platform that allow you to use it as a Currency, Commodity and Payment System. Thanks to the way it is designed. All of it is true. Yet there are no details. It is generic, yet an intriguing answer as a single phrase. If more information is asked then you can break it down in the 5 parts. It will still don`t answer everything because that is impossible to do simple. But it allows to lay out the gist of it. Which is all is needed unless you really want to go academic on it. Which is futile unless whoever asked wants to know more or cares to know it all. What is the point of having the answer to what Bitcoin is laid out like that? What is missing from it: It is not overly technical, there are no super complex terms or ¨overly compressed¨ concepts, long explanations to give and it is not infused with any kind of political tint. Yet it is true, it is accurate. Whether anyone else agrees with me or if you agree on that is actually irrelevant. It all can stand on its own. It will even apply to not just Bitcoin. But Cryptocurrencies modeled after it. Ok, But what about fuller answers? I think the full answers are already out in The Original Bitcoin Academic Paper, Bitcoin.org, The Bitcoin Wiki, and even The G+ Bitcoin Community I happen to run. As fuller answers need more involvement and engagement with a lot of info, concepts, etc. And depending who is asking or who is telling, it may not be needed or It may be overkill. Things have finally aligned and am now ready to give Appatic another go in a daily basis. Because of that, also do want it for it to make sense economically. But at the same time I don`t want to be running third-party ad networks. Or to fill the blog with Ads that will probably be poorly targeted and annoying. I have never done so, even if it could had made sense in economic terms, because that is just so not me. Then the only possible solution is offering targeted 125x125 AdSquares from sponsors I like, for things I would be comfortable recommending. In many cases from services I myself use. And it is what I had set myself to find. In the past year, I have had dozens of AdSquares submissions. Of those, in almost all cases I was NOT OK with putting AdSquares for what was being offered. Even if that meant passing on some easy money. In others, the sponsor-to-be parties got suddenly acquired. So, instead, am slowly finding sponsors by reaching into brands, products and services I have come across or that I use. Even if that means starting out as affiliate in some cases. In total there is 10 and only 10 AdSquare slots available. If you are interested, please reach out. The prices I am charging are introductory, as in offering a lot of value. Anyway. I still have got the very first service I am glad to promote and advertise. That being BitcoinWebHosting.net. A web host mindful of privacy and that will also take Bitcoin among its pay options. How could it not be great to be supported by a service like that. And that by the way, paid me in Bitcoin too. Which brings me to note that I am very open to Bitcoin or Litecoin Accepting services,products and brands. Other ways I have looked on to support me are accepting Sponsored Posts. Which are a good choice for many apps and services looking for a space to be featured. Other than that. You can also help me out via the Flattr Button in the right sidebar or by donating to me in Bitcoin or Litecoin. You can find the addresses at Appatic About Page. If you decide to support the blog, an in turn, me. I thank you in advance. Finally, I will be completing some upgrades to the blog template and within weeks you should start seeing the blog being updated Monday to Friday. For 15 years of the 20 years I have avidly MSFT-Watched, Microsoft has always got some of the most critical and glooming news and journalism coverage. It all started as soon as Microsoft reached the top of the world. With the outcry that it was too big and too competitive and it needed to be broken up. Fast forward 15 years to now and there still an outcry for it to be broken up. Now because it is not big enough and not competitive enough. Steve Ballmer stepping up to the CEO position of Microsoft in the dawn of Year Zero, A.K.A 2000 A.C was always for some reason seen as if he literally had pushed out Bill Gates from the position and he during all this trajectory had 100% of the power and had made 100% of the decisions. Not the case at all. In reality, Bill Gates was undergoing a change of thinking and character that made him want not to be CEO. Unlike what others say there was not really anyone but Steve Ballmer who could had the mantle. As Bill Gates was until the very day of his own retirement still a very strong gravitational force to be navigated with. Ballmer from even before was already quite misunderstood as somehow not capable enough. Even if he happens to be one of the smartest men alive when it comes to financial math ever and one of the best and most enthusiastic high level seller and business drivers ever to exist too. Yet Judging from the coverage of his so far 13 2/3 years as CEO, that is not enough. Much has beed said about how Microsoft managed to triple revenue and doubled profits under Steve Ballmer. But that it is nowhere the whole picture. Ballmer did so while tripling the workforce and living through both the post-DotCom crash crisis when Microsoft lost the Pumped by Hype Stock Value and the worldwide 2008 economic meltdown that changed and elongated the Desktop PC market renewal cycle from then to now. You don’t see many mentions of that. Even if it those two events ended or crashed a lot of big companies. Instead you see only endless posts wondering how could it be Microsoft let Apple and Google get so big. That is an incredibly oblivious and obtuse narrow view of things. Microsoft Business Models through partnering is unique in how broad it is in spectrum to the consumers it targets and the high scale of the money making that happens beyond Microsoft. Yet still tied to Microsoft. If you take the money Microsoft makes plus the money Microsoft partners make and also throw in the money generated non-partnered – as a matter of speaking – the Microsoft tied economy generates at least 1 Trillion USD of revenue per natural year. Which also gives away one of the reasons why it is literally impossible for Microsoft to move as fast as a small startup. In Windows Vista you could finally burn a DVD. That only came to be only after Microsoft fought for including it, rationalizing that it was enough of an obvious and expected feature for 2006. Windows Live OneCare was killed because of the added pressure the oversight added. Which paid Windows security software companies exploited since they protested OneCare was unfairly undercutting them and that it was too cheap for the amount of features it had. apart from some retail space sabotage the companies engaged in. Microsoft revenge was releasing the code worked for it as Microsoft Security Essentials for free. Superseding Windows Defender that only combats the very most common and urgent malware and anti-spyware as informed by Microsoft Patch Tuesday Updates. If you paid attention you could also see that it was released without fanfare and not promoted until after the Anti-Trust oversight ended. Or that it is now built in Windows 8 as a super charged Windows Defender. All of that? Not an accident. PlayTo is one of the most overlooked features in Windows Media Player introduced with Windows 7. And it does what Apple later shipped as AirPlay. Before Windows 7 RTM release and at the very start it was going to be promoted as it was demoed in conferences. But rumblings from Media Partners started and Microsoft got shy. It is also not a coincidence such a great feature is buried in WMP. It was the only way it could be shipped. And just as these stories, there are many many more. I personally must know dozens. 2.-Balancing USA Governance While Being Global. Now that certain events have come to the light that don’t need any more hype. You would then be able to tell there is a lot more oversight Microsoft has to endure while at the same time not being able to talk about it. Oversight that don’t just happen in the USA to be fair. It happens everywhere and no one can even talk about it. First because it is probably requested and silenced by law. And there is then the problem of revealing strategy in advance to partners and competitors. Most of Microsoft strange ways of conducting PR is because they are super cautious while doing this balancing act. Then, once you understand those two reasons you should start to get just how well Microsoft has fared with Steve Ballmer or how good he is. Or why whoever replaces him needs to know all of this to heart. Now, let me do some criticism of Stevie B. Stuff that really made me sigh because I know he could had done better. When Steve Ballmer said to Mary Jo Foley that he regretted the loopedy-loo from Longhorn to Vista he don’t meant that he regretted Windows Vista shipping at it was. He meant he regretted that it didn’t shipped as it was earlier. Anywhere from 1 to 2 years earlier. Which is what would had happened if he had not trusted as much as he trusted the at the time Windows Team. Windows Vista was a very good OS, Specially considering it was made in a rush in just 1 and half years on top of Windows Server 2003. After Windows Longhorn that had been built on top of Windows XP had to be scrapped as it had become too unstable to ship and possibly maintain. The most costly presentation Microsoft ever made had to be when they presented Windows Longhorn Concept as a video mockup. In what had to be one of the last times Microsoft ever presented something like that in advance and let so much detailed information about a Windows OS float around so far ahead in advance. It pretty much allowed all sort of concepts to be ripped off by Apple for OS X. While at the same time later Apple even dared to say they came up with all they stolen themselves. Sure, they did do executed it first. But hell no on they being the ones that came up with it. On a positive note. KDE and Gnome guys did put the concepts to good use. And there is a reason why they didn’t went around saying Microsoft copied them. ugh. Anyway. It is now ancient history but you can see how Apple is still not coy on copying design elements for their UI from Microsoft. Yet they mostly get celebrated for it. Why and How Windows Vista got to be so reviled if as I said it was a “very good OS” must be something that you thought while reading point number one. You can thank mostly Intel for that. The dirtiest non-secret secret of Windows Vista was that because it got built so fast and security security security and pizzaz pizzaz pizzaz was where things got more focused on. The OS was never performance optimized or focused as it should. But it still ran very well as long as you had a dedicated GPU to offload some performance cost and enough ram. To this day if you activate all the effects and add all the visual extras is the flashiest by default OS from that time and maybe ever. Up to a fault. More Bad Luck still could not leave Windows Vista alone and it resulted Intel had at that moment lots of old chips they wanted to still sell. But that they were finding hard to move. So they coerced, I mean convinced Microsoft to lower Vista hardware requirements for certification and to put some blinders while Intel worked their magic and sold their stuff. The domino effect this caused was catastrophic. Nvidia got lazy with their drivers thinking performance would not be as bad. OEM’s started shipping this underpowered hardware and since the requirements were lower, they also cut back on the RAM offered. You know what followed as advance reviews on new hardware rolled in with underwhelming chips, still not fully baked Nvidia drivers, less ram than needed provided. By the time Vista SP1 arrived, the reputation damage to Windows Vista was just not repairable. The reputation was so damaged by those initial impressions. That people that had never even seen or used Windows Vista had heard, read or been told to “stay with XP” and “Vista is terrible”. As demonstrated in the Windows Mojave campaign where people that had never seen or used it, liked Windows Vista when they were told it was something else. And then when where told it was Vista, they were shocked because they had heard or read terrible things. This debacle was such a mess that it is the original reason Microsoft-Intel relations soured. There is only one reason why Zune Hardware didn’t did better. It never was an international product until too late. The hardware and the device software was amazing for its time. It had wireless zune discovery, content sharing, PC syncing and PC networking. It had TV out with a Media Center Lite UIX. It lasted and lasted. Only people that got one with the original All-You-Can-Eat offline Zune Pass subscription + 10 free tracks a month and Zune Social can get how amazing it truly was. Yeah, not many. So sad. My personal guess on why it was not rolled internationally was because of the fallout caused by the shutdown of the PlayForSure deals stalled renegotiations of music deals for the Zune Marketplace. I still think Hardware should had been pushed internationally even if stand alone. Even the first gen was a great device. Half Toshiba Gigabeat, Half Microsoft Hardware and Software. Zune should had been 10 times more successful than it was. Fun facts: Even with its mostly USA-only release still managed to reach 2nd place in PMP by Gen 3. PlayForSure content while not advertised or legally supported, it still played. Zune HD sequel with WP7 as a response to the iPod Touch. I just wanted one. Enough said. The other Loopedy-loo and a story that is so not written about I will give it its own post later. As it is a REALLY important story in context of everyone always asking how it could be Microsoft failed in Mobile back then. Also in context of Android own rise to dominance. Well, I remember the very exact reasons. Needless to say the story is incredibly similar to the Windows Longhorn Saga. Such series of events even got most to blame for Steve Ballmer being overconfident and too candid on the record – and in video no less – when asked about the original iPhone. By now, if you read through this post you can understand why Frank X. Shaw got so frustrated with the news coverage of Steve Ballmer after the announcement he was going to retire. Also what he tried to imply. Even if he cannot be full frontal about it. Which is why he loves to retweet certain tweets instead. Microsoft is complex because it is big beyond itself being also very big. Fully understanding the company does take a long time. Most of those writing about Microsoft just don’t understand it because they are not able to perceive the whole of it. Running Microsoft it also a very big job. One that gets reduced to a few easy to digest narratives for the sake of churning out salacious posts. Steve Ballmer is still CEO of Microsoft and will continue to be according to what he has said from 9 o 12 months. And while he has been rushed on that call by certain move in the Microsoft board as even Rupert Murdoch noted. It not by as much as some bloggers would make you believe. Steve Ballmer always said that he wanted to retire by the time his youngest son went to college. But at another time in 2005 or so. He also had said he would be in at least 15 years. So, at most he would be leaving his CEO job by 6 months or maybe he even could end up staying in CEO very close to the 15 years minimum he wanted. After he is done. He would still be part of Microsoft Board along with Bill Gates. Coverage makes you think he will just be golfing, cruising in his fleet of ford cars and going to sport matches. Anyway, the whole point of this long post is to explain how there is more to the story that you commonly read about. And that when it comes to Microsoft and Steve Ballmer there is tons more to the story you never read. So, Hey Steve, have a good time in the road toward retirement and carry on. Back in 2010 I posted on Joulemeter 1.0. At the time an Alpha App which allows you to track your PC power consumption over time for as long as you want. I have been running it in one of my laptops since July of 2010. An ASUS 1201N. This is how 37 months of power consumption look like for it. And yes. It has been on pretty much all day, every day since day. And I also can tell you that it only consumes around 3mb of RAM on average if only running it as a App Process Service and 5mb if you keep the Stats Board in your System Tray. It occurred it would be good to look back on and write about it. The first time I read anything about Bitcoin was back in late 2009. Don’t thought much of it at the time as it apparently was only a paper. That’s not true of course. But I had read about many Digital Money or Digital Value Storage and Electronic Store of Value attempts before that. All the way back to 1995 to the rest of the 90’s, where ideas of hypercards, USB smart keychains + programs and PCI cards + programs were the kinds of ideas been explored to create a good proposition for Digital Money. Then came the Web App ideas like eGold and Paypal that focused on distinct parts of the Digital Money proposition. Ultimately none of those evolved into being true digital money. Neither were the other abstractions than were more of a virtual currency like the Linden Dollar, WoW gold or EVE credit from a public side or financial electronic token ideas that were not just proprietary but also isolated and obscure. So when I first read on it. I didn’t even bothered to read the actual Bitcoin Paper. Historic examples had me that jaded. Until I saw that Bitcoin was still around and evolving in 2010. Then, then I read the paper. I was skeptical but intrigued on how good the thinking behind it was. It covered many angles, it had many theories well fleshed. It simply was damn good. Which led me to just track its progress. It only really started connecting with me in 2011 as I collected Bitcoin from faucets and random people that gave it away. In truth, my first Bitcoins were given to me for free as it is the case of many others. Bitcoin then was also finally fleshed out. Trust and demand started to pick up and so did its utility online. Revealing the potential in it. Once 2012 arrived I was fully into it. I had purchased what I could which was very very hard since I am in Mexico City. Something that then led me to be very timid in how much I invested on it or how long I held on to what I had. Meaning I am not Bitcoin Rich at all. I will disclose that the profit I have got from Bitcoin so far is in the single-digit thousands of dollars since then. Something that is my fault because of getting discouraged by how hard I found it to purchase it back then in a trustworthy way. Leading me to avoid two chances at high risk. If I had taken the first one I would had made $100K+ USD. If I had taken the second one I would had made some tens of thousands. By the time I wanted to jump into it a third time it was too late. Do that soured me on Bitcoin? Not at all. That, as with other things was not the main motivation on why Bitcoin interested me. For me it was all about the Technology of it and the principled ideas intrinsic to it. In a balanced and grounded way I may add. While the most obvious question when it comes to any news coverage on Bitcoin is “What is Bitcoin?”, I still feel very much it continues to be badly answered and that the defacto answer is now a canned bland phrase. The same comes for when people make allegories comparing it to Napster or MySpace. Ignoring that the history of digital money and digital currecy is already deep enough to make such comparisons ridiculous. In this very post am aware I am still part of the problem. But i will make another post answering those basic questions and simplifying general explanations about Bitcoin without making the answers too boring nor too plain, or so I hope. As I like to be in the conversation when it comes to Bitcoin and Cryptocurrency. Something that also got me to jump at the chance of being one of the co-founders, co-owners and moderator in The main Google+ Bitcoin Community. Community that is also the one honored to be listed in Bitcoin.org. When it comes to me personally. I am not interested in the hyperbole of Bitcoin Hype-Pumpers or the trollish negativity of those hell-bent against it. I fall in the middle of those spectrums and for me looking at the bigger picture is always essential. Zoom In and then Zoom out as many times needed. Only way to not lose perspective, objectivity and context. The whole reason of this rant post is to simply lay out some my thoughts, my story and my perspective on Bitcoin. There are people that have suggested I only like it because of the speculation or simply didn’t really had any clear idea of where I stand on it and have been curious. The point is to state that for one I am not polarized on it at all. I disagree in seeing Bitcoin as a Zero Sum Game. I also disagree vehemently its only possible goal or finish line is to completely subvert other currencies or governments. Specially when it comes to the Top 10 ones. Thoughts and perspectives that are just flat out misguided and a bit delusional because those spewing it lack a global thinking perspective and sensible amounts of common sense. As in my opinion, Bitcoin whole point is to be the first step to a truly useful form of digital money that can serve as a secondary or tertiary destination to store value, do payments, vote monetarily in a censor-free way synonymous to regular Fiat CASH that can transcend the physical limitations to it. It being the primary currency is only possible in the smallest countries or countries where the national currency loses most of its value every 20 years. But Bitcoin is and should be the option and choice to use for when you want to use or store your money like you do with cash anywhere in the world without it mattering if you are there or not. Regardless of what happens with Bitcoin. It happened and it can only evolve and revolve if necessary. Just like other disruptive P2P tech, like, lets say BitTorrent. Literally and figuratively the buck don’t stops here. It is after all not just a currency. It is a commodity, it is a network design, a payment system and a platform. A whole block of principled utilitarian technology for Money. It is a big deal. Further Reading: What Is Bitcoin?